This animated affair centres on Fu (Heder), a large, unassuming rabbit who wants nothing more than to be the best cook that he can be. After rescuing martial arts master Shifu (Arnold) during an ambush, Fu is gifted with the magical power of kung fu. Tasked with a mission to return a tablet to Shifu’s daughter, Penny (Black), Fu must become one with his new power and take on the big, bad, imposing figure of Slash (Duncan). Let’s get it out of the way: yes, this is a blatant rip-off of the enjoyable Kung Fu Panda. From a quick search on the legalities of such a film, it appears that there are actually quite a few Kung Fu Panda rip-offs out there, with this apparently one of the better ones. 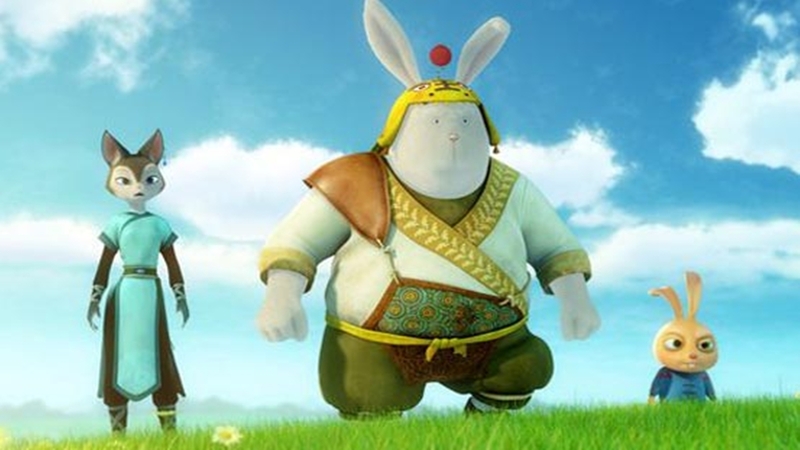 That bodes amazingly badly for the other films that have pulled on DreamWorks’ Jack Black starrer, for Legend of Kung Fu Rabbit is a feature that falls short on so many levels. As if a remarkably derivative story weren’t enough, this rabbit’s tale is a sluggish, poorly thought-out feature that never threatens to do anything more than simply just get by. For the full review of this pointless piece of pap, head over to Starburst Magazine. Tags: film, Film Review, Film Reviews, Jon Heder, Legend of Kung Fu Rabbit, Michael Clarke Duncan, Rebecca Back, review, Reviews, Tom Arnold. Bookmark the permalink.